Creating active and responsible citizens that identify and analyze public problems; deliberate with other people about how to define and address issues; take constructive, collaborative action; reflect on their actions; create and sustain groups; and influence institutions both large and small. 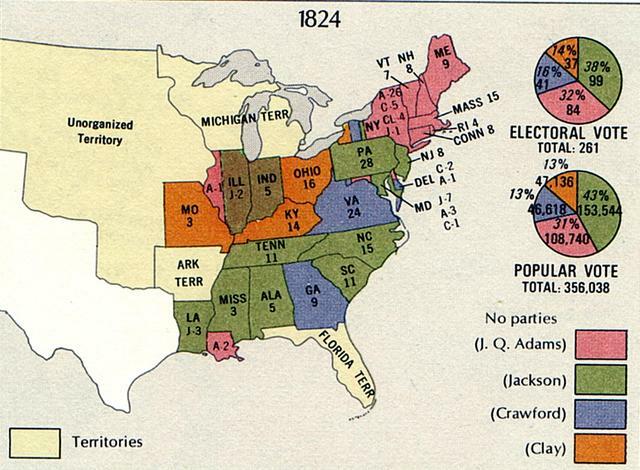 Students will be given the electoral map from the 1824 election. Students will then be confused and I will send the primary source link to the students. They will be asked, Who won? I will then give a lecture the way that I’ve always done that gives the WRONG conclusion. The students will then play the Kahoot game again. After this they will be in total confusion. We will play the Kahoot game again and this time students should get all of them correctly. And that the House of Representatives choosing was a feature of checks and balances in the presidential election that has not been used since. All five of the presidential candidates will appear in a challenging matching part of the test.